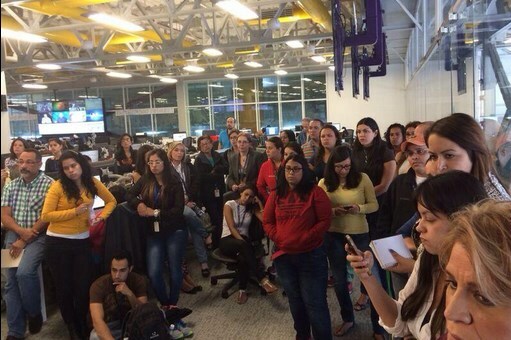 Sadness at GÚN’s newsroom, thanks to HegemonCorp. Two more high-profile journalists have been fired from what remains the largest newspaper group in Venezuela, Grupo Últimas Noticias (GÚN) were fired this Monday: Erys Alvarado, the newsroom’s director, and Jovan Pulgarin, editor of the group’s sport newspaper Lider. At the same time, the main graphics director Carmen Riera resigned in protest. According to the SNTP (National Press Workers’ Union), at least 32 people have now left the newspaper group, whether they were fired or resigned, since the purchase of Cadena Capriles by a mystery group almost one year ago. The case of Pulgarin is very similar to what happened with Omar Lugo, editor of the business news paper El Mundo. Lugo was fired last November due to official pressures, basically for running a headline the government did not like. Anyway, Pulgarin paid the price of such high-level criticism with his day job. In the case of Alvarado, she was fired for allegedly being considered “an opposition plant”, according to former head of investigative journalism at GÚN Tamoa Calzadilla, another victim of the purge. The staff at GÚN’s newsroom has been actively resisting these events. They have held assemblies and demand answers from new chairman Davila and from Últimas Noticias editor Eleazar Diaz Rangel, to no avail. Meanwhile, journalists have decided to leave their names off of the articles they published for the last couple of days in protest. But looks like HegemonCorp. won’t stop in its drive for editorial synergy with the State media apparatus, just like they did on May 19th. As the rest of local newspapers are still facing the threat of fading away thanks to the newsprint shortage (only contained by small gestures of solidarity), government papers have more than enough print to waste on propaganda disguised as news. That’s the communicational hegemony at work!